Andy Peaks insists he doesn’t mind how AFC Rushden & Diamonds get back on track, as long as they do quickly. 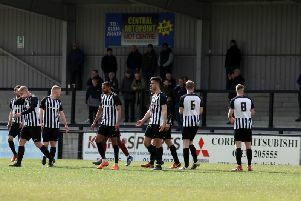 Diamonds have hit a blip at just the wrong time with three successive 1-0 defeats, the latest of which was at promotion rivals Royston Town on Saturday, seeing them fall six points behind leaders Kings Langley in the battle for automatic promotion from the Evo-Stik Southern League Division One Central. Peaks’ team now sit in fourth place and still have work to do to secure a play-off place. They take on Uxbridge at the Dog & Duck next weekend and Peaks knows his team need to stop the rot as soon as possible. “Next Saturday is a massive game for us and I am not bothered how we do it, we need to turn things around,” the Diamonds boss said. “I am disappointed, of course. I said we needed to win seven or eight of our last nine games and now there is more pressure on us to do it. “We have been used to winning matches at this football club and I have been used to winning as a manager so this isn’t an easy time. “But it means we all have to come to the fore. I am prepared to do that and we will be ready for next weekend. Diamonds could be as many as eight points off the top of the table tomorrow night (Tuesday), should Egham Town beat Bedford Town in one of their two games in hand. Peaks, meanwhile, completed another new signing yesterday with the addition of midfielder Tom Manship. The 28-year-old joins Diamonds following a short spell with Corby Town and lists Gainsborough Trinity and Hyde United among his former clubs.